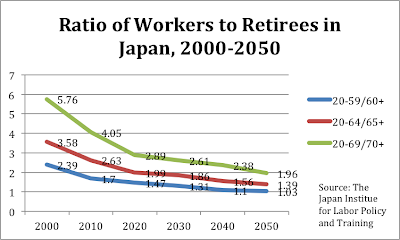 Even as the Japanese people confronted slow growth and considered whether the longstanding institutions of Japanese capitalism would be able to guarantee prosperity in the future, they faced the prospect of an aging, shrinking population and worried about the stability of Japan's social security system. As baby boomers retire, Japanese society, like other developed societies, has become increasingly worried about whether the government would be able to meet its obligations to provide social insurance, pensions, welfare and poverty relief, and eldercare. One has to wonder about the extent to which anxiety about Japan's social safety net has influenced household decisions about consumption, savings, and investment and their appetite for higher risk, higher yield assets during the "lost decades." The question is whether public anxiety about Japan's social safety net has depressed aggregate demand beyond the basic effects of too few Japanese chasing too many goods as argued by Edward Hugh. Arguably, the DPJ's program while in government (at least for the first year or two) was implicitly based on the notion that reducing insecurity about the safety net could yield macroeconomic benefits. In this post, I will document the persistence of public fears about the social security system during the lost decades. Since at least the late 1990s, anxiety about the stability of the future of social security has regularly ranked at or near the top of the public's priorities in economic policy, which remains the case today. Any discussion of the impact of Abenomics on the economic behavior of Japanese households has to weigh Japanese attitudes about the social safety net. 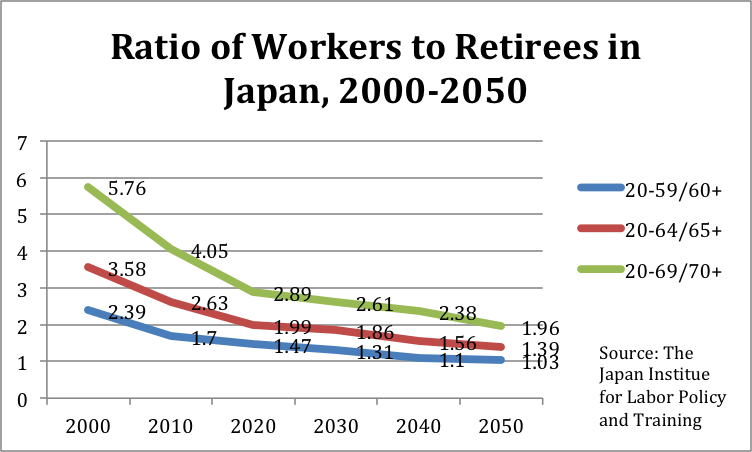 If Abe is unable to ease fears about the government's ability to provide for retirees, any gains to Japan's economic performance could prove short lived. We can see these fears about the safety net as early as 1997. A March 1997 Asahi poll asked respondents whether they felt some anxiety about their future livelihoods. 69% said they said, versus 29% who said they did not. When those 69% were asked to explain what they were anxious about, the most common response was pensions and social security (30%). Only one other reply — "my personal health" — was in the double digits (11%). The same poll asked respondents to state the degree to which they felt confident in the future of public pensions systems. 42% expressed either great (5%) or some (37%) confidence, while 55% expressed either little (44%) or no (11%) confidence. The next year an Asahi poll found that more respondents were most uneasy about pensions and social security (30%) than about Japan's economic outlook (28%), their incomes (20%), or their jobs (13%). Perhaps the clearest picture of public insecurity in the late 1990s can be found in an extensive July 1999 poll on questions related to Japan's aging society. The poll was based on face-to-face interviews with 2122 respondents nationwide, marginally more than Asahi's monthly telephone polls, which usually have between 1500 and 2000 respondents. The survey paints a portrait of wide and growing anxiety among the Japanese public about life after retirement. Asked if there is anything in particular they feel uneasy about for their retirement, 28% of respondents said they were most uneasy about living expenses and other economic concerns, the most popular choice and an increase of six points over a 1994 poll on aging issues. Even more dramatic was the finding that 85% of respondents did not believe that contemporary Japan provided for a secure retirement. The survey found the public was concerned about the "fairness" of the social security system (23% thought it fair, 68% did not); was nearly evenly divided over who should bear the burden of higher medical costs as a result of aging (25% said to make the generations currently working pay more in premiums, 32% said the elderly should pay more in premiums and fees, and 28% said that all should pay more through a consumption tax hike); and believed that most attention should be paid to pensions as opposed to health insurance or nursing care insurance. The same poll found that when asked whether they expect the state pension system to provide for them, roughly two out of three respondents either greatly (33%) or to some extent (32%) said they counted on their state pensions. As Japan's stagnation deepened, the public focused more on economic policy than on the safety net, and public opinion polls reflected shifting priorities. Polls during the Koizumi years simply did not ask questions about welfare, social security, or pensions. It was almost as if through his frenetic activity in other policy areas Koizumi Junichirō made the Japanese public (and the Japanese media) forget about Japan's aging society and safety net anxieties. However, when polls did ask the public to assess the Koizumi government's social security policies, the response was not favorable. 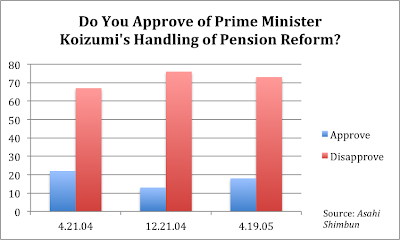 For example, in an April 2004 poll concerning Koizumi's first three years in office, 67% of respondents said they did not approve of Koizumi's pension reforms. 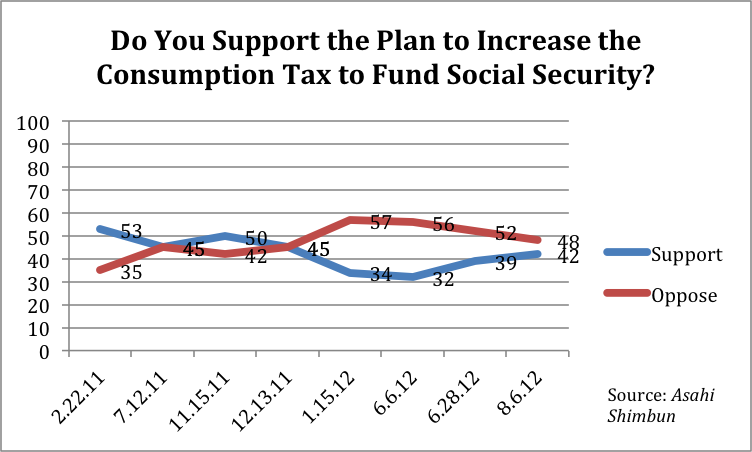 By fall 2004, anxiety about the social safety net had returned to the top of the public's concerns. Asked in September what they would like the recently reshuffled Koizumi cabinet to make its top priority, 52% said pensions and welfare, topping all other choices by a considerable margin, including jobs and growth (28%). By December, dissatisfaction with the Koizumi government's handling of pensions grew, with 76% disapproval (and only 13% approval). Of course, postal privatization dominated public discourse for the bulk of 2005, but public concerns about the pension system did not vanish: a poll taken in November 2005, after Koizumi's landslide victory in September and another cabinet reshuffle, found that 56% wanted the government to make pensions and welfare its top priority, with jobs and growth policy in second place with only 17%. Koizumi effectively bequeathed to his successors a public hungry for the government to fix the social safety net. 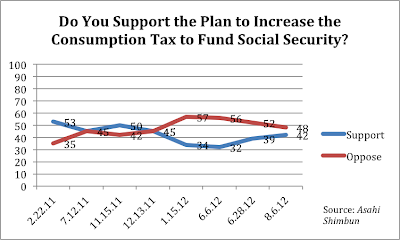 Polling in advance of the 2006 LDP leadership election repeatedly showed that voters wanted the election to focus on social security. For example, in January 2006, 45% of respondents said the campaign should center on "how pensions and health care ought to be," followed by 28% of respondents who wanted it to center on fiscal reconstruction and taxation. 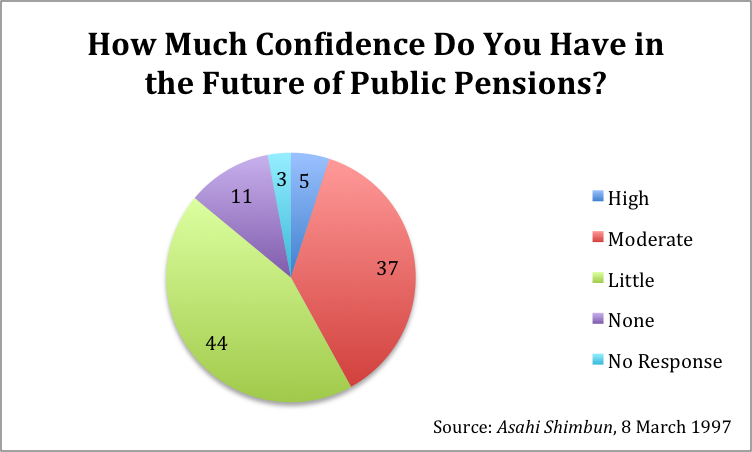 In September, after Abe Shinzō became prime minister for the first time, 43% of respondents said Abe should make pensions and welfare reform his top priority, with growth and jobs in second place with 17%. (And only 2% wanted Abe to focus on revising the constitution.) Abe, of course, suffered a crippling blow with the emergence of the "vanishing pension records" scandal, in which it was discovered that due to carelessness on the part of the Social Insurance Agency the pensions records of up to 50 million people may have been missing data. The scandal served only to heighten preexisting public fears that the social security system was not in fact secure, and ensured that it would remain a critical issue for the government to address. Noda obviously struggled to make his case to the Japanese people but it was not for a lack of concern on the part of the public. In late August 2012, after the tax increase had passed both houses of the Diet, an Asahi poll found when asked how confident they were in the social security system, 64% of respondents expressed not much (47%) or no (17%) confidence in the system, compared with 35% who had full (3%) or some (32%) confidence in the system. The same poll found the public evenly divided (43% in favor versus 43% opposed) over the idea of shifting resources from spending on the elderly to spending on child care and strongly opposed (60% opposed versus 31% in favor) to charging citizens over 70 more in fees for health care. For the moment the social safety net is once again second to economic policy in the priorities of the Japanese public. But if the Japanese people have had a constant concern over the past fifteen-twenty years, that concern is the viability of Japan's social safety net. As Koizumi discovered, if and when the economy improves, concerns over social security are bound to grow — and as Abe learned during his first government, those fears can prove fatal to a government. It is not entirely clear what the Japanese public expects their government to do to strengthen the social safety net, since support for tax increases to bolster social spending has proven so fragile. There may ultimately be nothing the government can do to reduce anxiety about the strength of the social security system. In an aging society public anxiety about the soundness of the safety net — particularly in an age of high budget deficits — may simply be an enduring fact of politics. Abe may have bought himself a temporary reprieve, but sooner or later public attention will turn back to the social security question. The next post and the last in this series will look at public opinion polling on attitudes towards saving and investment, an important indicator of 1) how much risk Japanese households will tolerate, 2) how eager Japanese households are to participate in new-style shareholder capitalism, 3) how much households are benefiting from the Abenomics boom, and 4) the degree to which Japanese depend on the social safety net for their retirement living expenses.